7) Use footwork. Pennington cannot back straight up. That will result in her being on the fence, where Nunes’ limitations regarding footwork and range finders won’t be exploited. What Pennington needs to do is enter and exit on angles, which will limit the amount of targets Nunes can get to and allow Pennington to get into and out of the pocket or clinch clean. That also allows her to take advantage of Nunes’ pressure, allowing her to gain superior position on entries and exits, giving her the ability to tee off on the lead or counter. Finally, Pennington needs to turn Nunes, because if her feet aren’t set she can’t throw combinations or get full power on her shots. Turning Nunes enables Pennington to walk her into shots, though she can also land shots then turn Nunes so she isn’t there for the return. The most important thing about using angles, circling, and pivoting is that it allows Pennington to get away without having to throw as much; i.e., she won’t throw shots she doesn’t have to because her own footwork and positioning will help her not feel threatened. Making opponents throw unnecessary shots is a big part of Nunes’ game, as it allows her to read her opponent, draw an attack, and counter accordingly. It also forces her opponents to burn energy “running” away from her and throwing more strikes per minute than they usually average. 6) Establish a jab. Footwork alone won’t get you away from Nunes -- her chin, explosiveness, length, and aggression are going to give her spots to get to you, so you have to disrupt that pressure to create space to escape without burning excess energy or getting blasted. The jab will blunt the pressure and will disrupt her opportunity to get her offense started. It will also allow Pennington to control the range in between Nunes’ bursts of offense. Most importantly, it will allow Pennington to get reads on Nunes to figure out her timing and decipher her patterns through combination jabs, probing jabs, or feints. 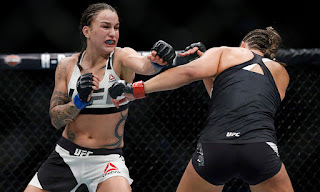 The jab is multifaceted, as it creates a bridge to transition ranges and sets the table for the entirety of her offense, whether it be her right hand, her kicks, or her clinch and takedown attempts. It provides a path for clean exits whether she is choosing to move out of range or she is being moved out of range. Sara McMann and Ronda Rousey didn’t have active and diverse jabs, which resulted in them being summarily dispatched. 5) Create scrambles. As dominating as Nunes can be in getting the fight to the ground and working on the ground, much of that is pure physical strength, physicality, and power. It’s not her well-executed grappling or her mobility and fluidity on the ground. Nunes can be had on the ground, and has been had on the ground. in most cases Nunes’ physical attributes are too much for most fighters at bantamweight, and most fighters either try to escape or survive in grappling positions, as in fights with Shevchenko and Germaine De Randamie. 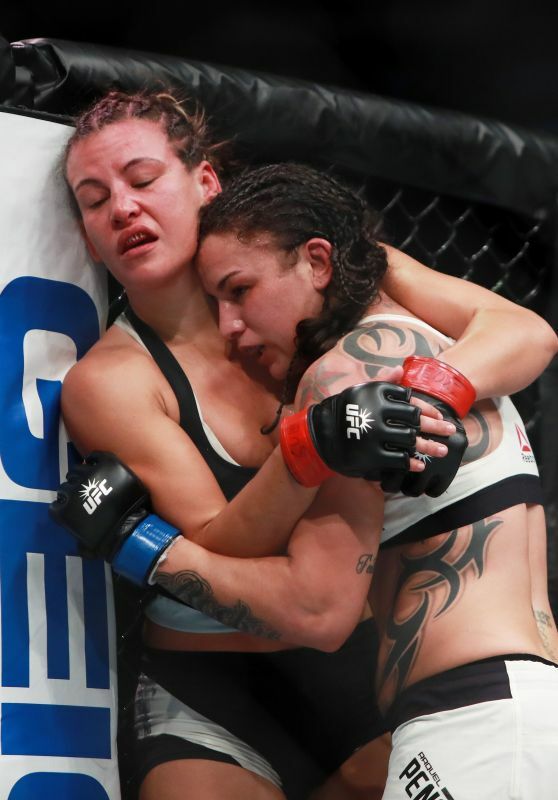 Pennington isn’t as big as Nunes, but her all-around skill set, cage IQ, and situational awareness are good enough for her to initiate and win extended exchanges on the ground, as she did in decisive fashion when she brutally choked Ashlee Evans-Smith unconscious. As devastating as Nunes can be on the ground, when she has been forced to work in grappling exchanges, she has been outhustled to a decision by Sarah D'alelio, and ground and pounded into submission by Alexis Davis and Cat Zingano. 4) Exchange with Nunes at every level. While I will never suggest a fighter haphazardly attack an opponent in their wheelhouse, at some point or another, all fighters will end up in positions that favor their opposition. Pennington has to be willing and able to handle herself in spots enough to make Nunes work; there can’t be any phase or range where Nunes is allowed to cruise through. If that is the case, Nunes will have her working twice as hard to avoid certain ranges while allowing Nunes herself to rest, because then the goal becomes to avoid key spots instead of finding ways to neutralize them, or finding ways to get back to the range spots she wants. Pennington doesn't want Nunes to have any safety zones where she can rest and thereby maintain control of the fight and her poise. Pennington has to be willing to initiate in regards to strikes, wrestling, or grappling. Not only does she need to initiate at every range (not just counter), she has to be willing to engage in extended exchanges to exhaust Nunes by making her react and match pace instead of setting it. This is especially true as it pertains to the more energy-consuming aspects of mixed martial arts, wrestling and grappling. D’alelio and Davis engaged and exchanged with Nunes on every level, extending her and exhausting her; D’alelio did it to the effect of a decision victory where she just outworked Nunes, Davis did the same to the tune of a first-round finish. When Nunes hasn’t been able to dictate when, where, and how she engages with her opponents, or when Nunes is able to turn her opponents one-dimensional, she has won and done so decisively. 3) Attack the body. Nunes has length, explosiveness, and power, head hunting will end up with you missing strikes, as she dissects you with long range strikes or uses short back steps and pivots to get you to overextend and walk into counters. And many a fighter gets backed up, beaten up, and knocked out headhunting, losing confidence as they miss and get countered or outright get beaten to the punch. Attacking the body helps Pennington in three ways. The first way is by taking her opponent’s legs and energy reserves, which will limit her ability to explode, move, and be defensively responsible. The second thing body shots do is let the fighter using them find their offensive rhythm. The body is harder (if not impossible) to move the same way one moves the head, making it a much easier target for Pennington to lead or counter to. 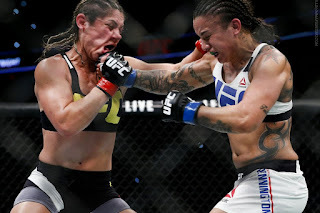 The third thing it would do is make Nunes hesitant and disrupt her rhythm, as she would constantly be getting jabbed, hooked, round kicked, straight-shotted or front kicked to the body, and it would be hard to defend or avoid those shots, especially if Pennington uses them as counters to aggression or strikes. 2) Throw in combination. Pennington isn’t a big hitter; she cannot turn or dictate the fight with individual strikes unless she is loading up, which will only serve her up for counters or get her off balance when she misses. To maximize her power, Pennington has to punch in combination, which will allow her to create openings for big shots, disrupt Nunes’ offense, and allow Pennington to put pressure on Nunes. Nunes wants to fight on her terms, and if Pennington is throwing one at a time or loading up, she isn’t making Nunes work on defense and she is allowing Nunes to pick and choose when, where, and how to attack. It’s Pennington’s job to keep something in Nunes face and to be unpredictable in doing so, which means she has to mix up her shots and throw more than one of them. This isn’t limited to punching combinations, but kick-punch combinations -- at range and in the pocket -- as well as knee, elbow, and punch combinations in the clinch. 1) Take her down. Nunes hasn’t shown the greatest ground defense historically. When on top she is hard to deal with, but when opponents have been able to put her on her back, she has been shown to be limited both offensively and in regards to counters; defensively she has been a bit of a liability. Nunes isn’t impossible to take down, but she is harder because of her stature and build. However, if an opponent would set up the takedown with strikes, or be confident enough in her own wrestling and athleticism to attempt reactive takedowns as Miesha Tate did, or initiate shots and clinch takedowns as D’alelio did, she could find success. But Nunes’ reputation as a wrecking ball and a physical fighter allows her to avoid being punished for her over aggression and tendency to fight in spots. Pennington has the skills at range, skills in the clinch, and skills on the mat to attack Nunes in a similar fashion to D'alelio and Davis; she just has to show a commitment to changing levels and using takedowns, whether initiating them or employing them reactively, to wear Nunes down, slow her aggression and explosions on the feet, tire her out, or put her on her back to punish if not submit her. 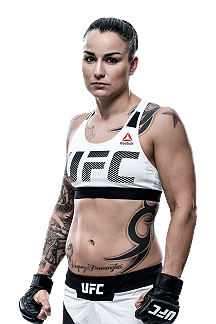 Raquel Pennington isn’t considered a favorite in this bout. She is the less accomplished, smaller, less athletic fighter coming off of a fairly serious injury and a prolonged time off, but i believe that Pennington has the cage IQ, situational awareness, durability, and adaptability to win the most important fight of her career. 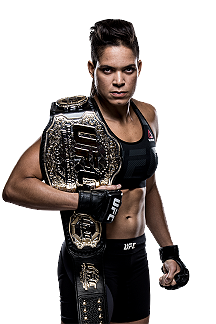 The oddsmakers may not believe in her, but if she executes these seven things, I don’t just believe she will give Nunes a good fight; I believe she can and will go home with the UFC Bantamweight Championship.